October 17, 2017, Elgin, IL – K40 Electronics, (http://www.k40.com) the premier manufacturer of award-winning, high-performance automotive radar/laser protection systems, announced today it will offer direct purchase of its products to independent mobile electronics retailers in Canada. By establishing a vendor direct relationship with K40, retailers can enjoy custom sales and store support, 24/7 access to dealer support services, and pricing that provides maximum profitability. Like most consumer electronics manufacturers, K40 Electronics utilized the distribution channel for many years to deliver its products to Canadian retailers. “We’ve blazed new trails in serving retailers and have defined the attributes that make up a personal vendor/retailer relationship in the US market, so we asked ourselves, “why aren’t we doing the same thing in the Canadian market?” said Rachel Clark, K40’s VP of Sales and Marketing. Protected profit margins with enforced MAP. Protected distribution with no big box accounts, consumer direct sales, or third party resale sites allowed. All components are tested prior to shipping to ensure an industry-leading, less than ½% warranty return rate. A diverse product line with variable pricing to fit any consumer budget. Live 24/7 lifetime support for dealers and their customers from K40 staff experts. 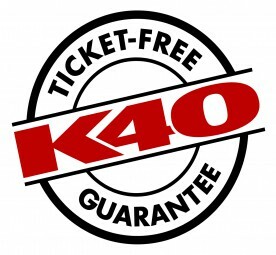 Established in 1977, K40 Electronics offers a full line of driving protection solutions for every vehicle and driving style and backs them with the industry’s first ticket-free guarantee. Canadian retailers interested in learning more about K40 Electronics products can call K40 at +1 (800) 323-6768.